Loving this “new to us” printed plate. 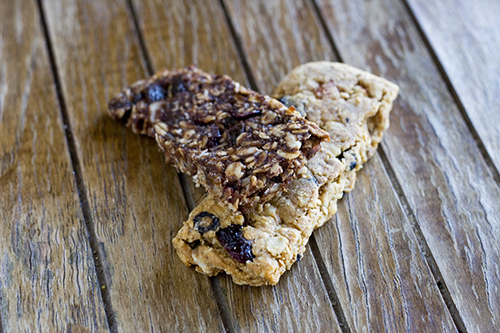 I made my first granola bars several months ago and I’m thinking their still my favorite. In any case they were my “first loves” so I wanted to kind of test the waters and see what else was out there. 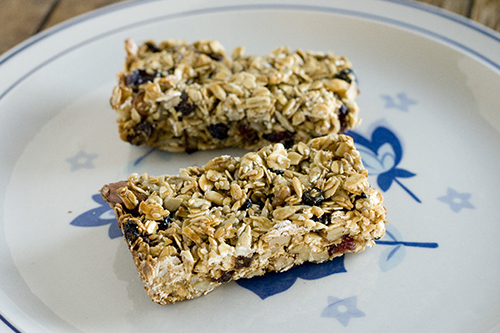 So here are a few of my most recent rendezvous with “other” granola bars. The lovely ladies in the pic above tasted wonderful and were very very simple to make but used sweetened condensed milk for the “glue” which is not as natural and healthy as I like to eat, although I wouldn’t have my cafe sua da any other way. Did I mention how easy these were to make though? Combine 1 1/2 c. oats and 2 c. mixed seeds, berries, and nuts. Separately mix 1/2 a can of condensed milk with 1 T. molasses. Then combine the two mixtures into one and press into a 8×8 oiled pan and bake at 350 degrees for 25-30 minutes or until the top starts to brown. Easy peasy! The (halved) recipe above is from Framed.com which is a lovely site by the way. Great photos, go check it out! The two granola bars below were good as well but the protein bar (bottom of stack – recipe below) had mixed reviews. No females liked it but another dude at my work and myself did. I’m not even sure protein bars are supposed to taste good, that’s why they are always dipped in chocolate right? The other bar (lying on top) reminded me of Danial’s biblical food pulse in the form of a bar. Read more on pulse and/or find it on the market under the name abundance. It’s kind of expensive to buy so I’m researching/working on my own golden recipe. All the females gave this one a thumbs up but to me there was still something amiss. So the search for the perfect granola bar continues. Something raw maybe, packed with protein and under 300 calories with good amounts of fiber is the goal. Oh and tasty, never forget tasty. Recipe taken form October 2008 issue of Sunset Magazine. I didn’t have all the ingredients on hand so I just added extras of some of the similar ingredients. Like dried blueberries and rasins in place of figs and more flour in place of the bran. I think I’ll give these another go. Each bar contains about 225 calories, 7.5 g protein and 4 g fiber. Line a 9×13 pan with plastic wrap and spray with cooking oil. In a large bowl mix together the oats, bran, flax seeds, flour, baking powder, sea salt, peanuts, cranberries and figs until blended well. Beat with a mixer the cashew butter, milk, egg, honey, lemon zest, and lemon juice until blended well. Combine the two mixtures until all is blended together well. Press dough into pan firmly and evenly then chill for about 30 minutes. Preheat oven to 300 degrees. Flip pan upside down onto a work surface to remove from pan then peel off plastic wrap. Cut straight down lengthwise once and then crosswise to make 16 bars. Cook bars on a baking sheet lined with parchment paper spacing them about an inch apart. Bake until lightly browned and kind of firm to the tough, about 20 minutes. Store airtight for up to two weeks or freeze. This entry was posted in Food, vegetarian, Whole foods and tagged bars, berries, Food, granola, nuts, seeds, vegetarian, whole. Bookmark the permalink. Both comments and trackbacks are currently closed.